Turkey has always claimed that it has been a part of the coalition fighting terrorism in its region, positively contributing to the security of the Middle East and Europe as well. However, recent developments in northern Syria present additional evidence that Turkey never ended its complicit relations with terrorist groups. Two developments shed particular light on these longstanding relationships. The first is the Russian-Turkish agreement to set up a buffer zone in Idlib governorate in September 2018(1). The second is the mooted withdrawal of American troops from Syria and subsequent threats to Ankara that America would “devastate” the Turkish economy if Turkey attacks the Kurdish “People’s Protection Units” (YPG) in Syria(2). The article will analyze both developments and assess their implications for Ankara’s claimed role in fighting terrorist groups in northern Syria, notably al-Qaeda affiliated Hay’at Tahrir al-Sham (HTS) and Islamic State (IS). The Turkish government colluded with terrorists by covertly providing direct military, financial and logistical support to IS from its inception, even while claiming it was fighting the terrorist group. There are several indicators that reveal this tacit alliance. First, Ankara was the main gateway for the foreign fighters seeking to enter Syria and Iraq to join IS, HTS, and other terrorist groups(3), to the extent that one article described the Turkish borders as the “Gateway to Jihad”(4). Second, in 2014 Ankara refused to allow the Americans to use the Incirlik air base in southern Turkey to attack IS. It held this stance for a full nine months before changing its official policy in July 2015(5), while preserving its relationships with the terrorist group. Third, Turkey established cross-border supply lines to Syrian rebels and terrorist groups alike(6). An IS commander informed the Washington Post that since the beginning of the Syrian civil war they had received their arms and supplies from Turkey. He even added that IS leaders were treated in Turkish hospitals(7). Finally, Turkey became accustomed to IS control of the Syrian side of the border. Ankara did not decide to intervene militarily until late 2016, when Kurdish forces in Syria liberated the town of Tel Abyad from IS. The declared aim of the intervention was to fight IS, but the real goal was to set up a 30-kilometer buffer zone with areas controlled by the YPG(8). The Turkish military intervention in Northern Syria was designed to establish a long-term presence in the region. Starting in August 2018, Turkey united various militias to establish a “National Army” compromised of 35,000 Syrian fighters, tasked with handling the security situation and policing the streets(9). Turkey also became directly involved with delivering services to local Syrians. They included providing water, collecting refuse, and the administration of health and education in some of the northern Syrian areas under the control of Turkey’s military and its Syrian rebel allies(10). Ankara also resisted all attempts on the part of the Syrian government and its allies to restore its control over Idlib. In September 2018, the Turkish president Erdogan succeeded with a deal with the Russian president Vladimir Putin that stopped the Russian backed Syrian assault before it recaptured Idlib. On the surface, Ankara justified its rejection of the military takeover on the grounds that a humanitarian crisis would ensue in the aftermath of the intervention, claiming that around 800,000 civilians could be forced to flee from Idlib to Turkey(11). However, the real reason is Turkey’s deep relations with terrorist groups, especially HTS, which control more than 60% of Idlib. This relationship can be seen in the fighting – the Turkish military has 12 observation posts along the frontline in Idlib, deep in HTS territory. Moreover, HTS controls Bab al-Hawa, the governorate’s border crossing with Turkey. All this suggests that there is a tacit agreement between Ankara and the group(12). In addition, the Memorandum on Stabilization of the Situation in Idlib signed by Turkey and Russia in September 2018 reveals Turkey’s deep relations with HTS. The agreement stipulated the establishment of a demilitarized zone 15-20 km deep in the de-escalation area. All radical groups were to be removed from this zone(13). Turkey was held responsible for fulfilling this part of the agreement, which reveals the leverage that Ankara retains over the group. For its part, HTS utilized the truce to expand its control over Idlib, taking more than 90 towns and villages from the presumed moderate opposition groups operating under the umbrella of the Turkey-backed National Liberation Front (NLF) by early January 2019(14). Ankara adopted a conciliatory position towards this development, as the NLF signed an agreement with HTS conceding and recognizing its control over large segments of Idlib province(15). Thus, in the final analysis, the agreement with Russia was utilized to reinforce the grip of HTS over Idlib with Turkish consent. In December 2018, President Trump’s unexpected announcement that he would withdraw American troops from Syria presented Turkey with another opportunity to fight the Kurds. In his phone call with Trump., Erdogan did assure the American president that he would carry on with the mission of fighting IS and finish the job(16). However, Erdogan prioritized attacking the Kurdish YPG militias over fighting IS, thus undermining the only rebel ground force that managed to inflict severe damage on the terrorist group(17) and indirectly preventing the YPG from eliminating the IS presence in the small pockets it retains in northern Syria. Trump’s miscalculation forced him to change his position towards Ankara, threating to “devastate Turkey economically” if it attacks the YPG in the aftermath of an American withdrawal from Syria(18). In an attempt to resolve the dispute, on January 13 Trump suggested the establishment of a safe zone. Two days later, Erdogan said that the Turkish military will establish this zone and that it could be deeper than 32 km. However, the American Secretary of State Mike Pompeo confirmed both sides have not reached a deal yet and the issue is still under discussion. Actually, such a solution would not solve the crisis, since the suggested buffer zone includes some Kurdish areas, most notably the town of Kobani. 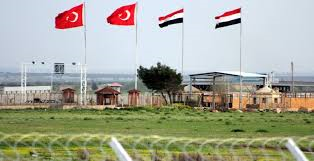 In addition, the Turkish media have reported that this zone will be utilized to rehome large numbers of Syrian refugees in a move that aims at changing the demographics of the border region in favor of groups loyal to Turkey(19). In the final analysis, the Turkish move indirectly benefits IS, as the YPG are no longer preoccupied with fighting the group. Turkey utilized terrorist groups in northern Syria as a tool to promote its foreign policy objectives. Initially, Ankara sought to undermine the Assad regime by sponsoring various rebel and terrorist organizations against him. However, with the backing of Russian military intervention, the army has managed to regain control of most Syrian territory. Ankara pursued a pragmatic policy in the face of these developments, adapting to the realities on the ground and abandoning its bid to force regime change in Syria. Instead, it began to focus on preventing Kurdish forces from controlling territories inside Syria adjacent to its borders while Erdogan made it clear that he will not tolerate the formation of a Kurdish state on Turkey’s southern border(20). In January 2018, Turkey resorted once again to using IS and al-Qaeda fighters in battling the Syrian Kurds. “Operation Olive Branch” aimed to drive the Kurds out of Afrin by sending 6,000 Turkish troops and 10,000 militants who were either former militants of IS or affiliated to al-Qaeda(21). In addition, Ankara enabled its loyal factions, including rebels and terrorist groups, to control neighboring Syria regions to ensure that the Assad regime will not exact revenge on Turkey by allowing the PKK to use Syria as a base to attack it(22), as it did throughout the 1990s. On the other hand, Ankara has capitalized on the European Union’s fear of the influx of Syrian refugees and terrorists through Turkey, using it as a bargaining chip to extract concessions from Brussels. In 2017, Erdogan went so far as to warn Europeans that they “will not walk safely on the streets” if a diplomatic row continued between Turkey and both Germany and the Netherlands(23). In addition, Erdogan successfully managed to pressure the EU to intervene to prevent Russia from backing Assad in regaining Idlib. This gambit was successful – several Western countries depicted the attack as a “grave humanitarian mistake” and supported the truce that was later signed by Turkey and Russia. In the final analysis, it is no exaggeration to argue that Turkey’s recent policies in northern Syria benefited terrorist groups, especially IS and HTS. Ankara’s policies hindered the forces capable of fighting them, whether represented by the Syrian government or the YPG. Given Europe’s fear of an influx of terrorists from Syria, it is expected that the EU will continue to reject any military offensive against Idlib, thus indirectly allowing the formation of a terrorist safe haven in northern Syria under Turkish protection. In the wake of an American withdrawal from northern Syria, the future of Idlib and the territories under YPG control would be the new front line of confrontation between Turkey and Russia. This may undermine their tactical understanding, which has persisted in recent months. (14) Jihadist capture of Idlib shows Turkish prioritisation of northeast Syria increases likelihood of Syrian government offensive, Jane’s Country Risk Daily Report, January 16, 2019. (17) Michael J. Totten, op.cit. (19) Syrian border ‘safe zone’ receives mixed reception, Jane’s Defence Weekly, January 18, 2019.